Centenary of Kolar Gold Fields – Issuance of Indian Postage Stamp. 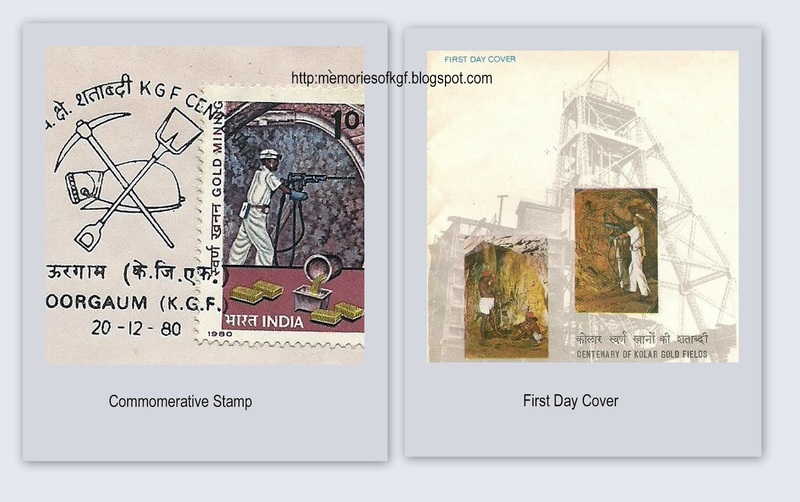 Philatelic Stamp Description : The stamp depicts a miner drilling for ore along with representation of molten gold being poured into a mould and a few gold bricks. The first day cover shows old and new techniques of drilling for ore against a mine head structure. Postal Stamp Print Size: 3.55 X 2.5 cms. 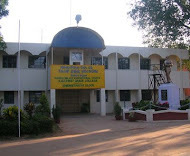 Kolar Gold Fields in the State of Karnataka are reported to have been mined for gold during the last 2000 years or so. 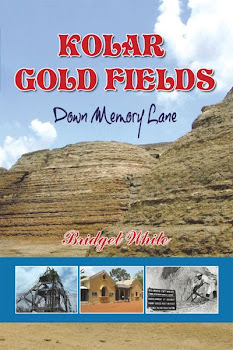 The gold lodes of Kolar Gold Fields lie in a narrow bond of rocks of Dharwar Series. The systematic mining for gold in this area during modern times was started by an English mining firm, John Taylor & Sons in 1880. 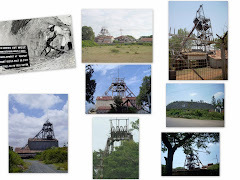 The mines were taken over by the Government of Mysore in 1956 and by the Government of India in 1962. The provision of railway connection in 1894 and availibility of electric power in 1902 from the first hydel power station in Asia at Sivasamudram played a key role in rapid development of the mines. These are some of the depest mines in the world, the deepest point being 3.2 Km below surface. Inclined and vertical shafts have been sunk either along the reef or across the country rock. The length of excavations underground in the form of tunnels, shafts, etc. total about 1000 Kms. The gold-bearing ore is excavated in a carefully systamised sequence and the shafts and tunnels are supported by steel arches lagged with timber to ensure safety of mine workers. In view of very high stresses ancountered in deep mines, excavations are also supported by granite, concrete, timber amd mill-tailing fill as a safety measure. During the early period of mining, the tenor of gold averaged about 40 grammes per tonne. During the past century, approximately 46 million tonnes of gold-bearing ore has been extracted yielding about 784 tonnes of gold. The present tenor of gold is about 5 grammes per tonne. The present management, Bharat Gold Mines Ltd., a Government of India undertaking, attaches considerable importance to measures providing safe and hygienic working conditions. Instrumentation of working areas to monitor possible violent rock failures, adequate ventilation, effective dust suppression and fire fighting equpment are some of the measures which play major roles in this sphere. Regular radilogical examination of workers and sampling of underground ore for toxic dust are important industrial hygiene measures undertaken by the management. At present about 12000 employees of various categories are on the rolls. Being a labour intensive industry, massive efforts are made to educate the workers in accident prevention. High priority is also given to the welfare of the employees.